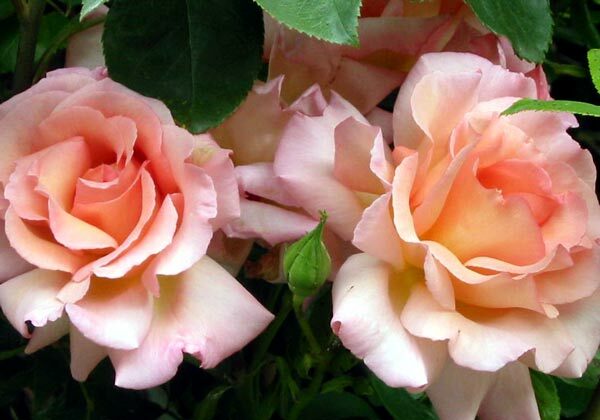 Two strong climbing Compassion roses are a delight growing on the house patio pergola. They are beautifully fragrant, and flower from late spring well into the beginning of winter. 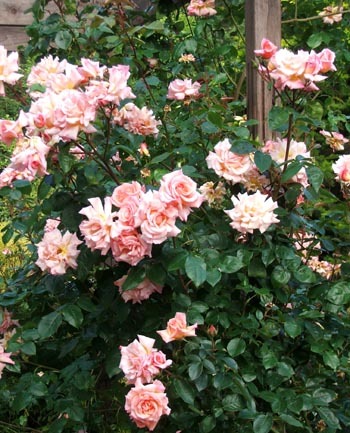 The climbing rose Compassion is a wonderful rose to pick for the house - there are always flowers with long straight stems to choose. The foliage never seems to succumb to any of the fungal diseases which from time to time play havoc with some of the Moosey roses. And even by winter there are still a few flowers to enjoy. I really adore this strongly formed yet delicate rose. When I chose the Compassion roses for the house pergola I was looking for three things - a budget price, repeat flowering, and fragrance. Well, I luckily managed to get all three without doing any research. The later blooms in autumn are an even deeper shade of luscious apricot and peach than the first flowers. Yum!